I fall in love the way some people drink coffee—quickly, all at once and at the slightest opportunity. 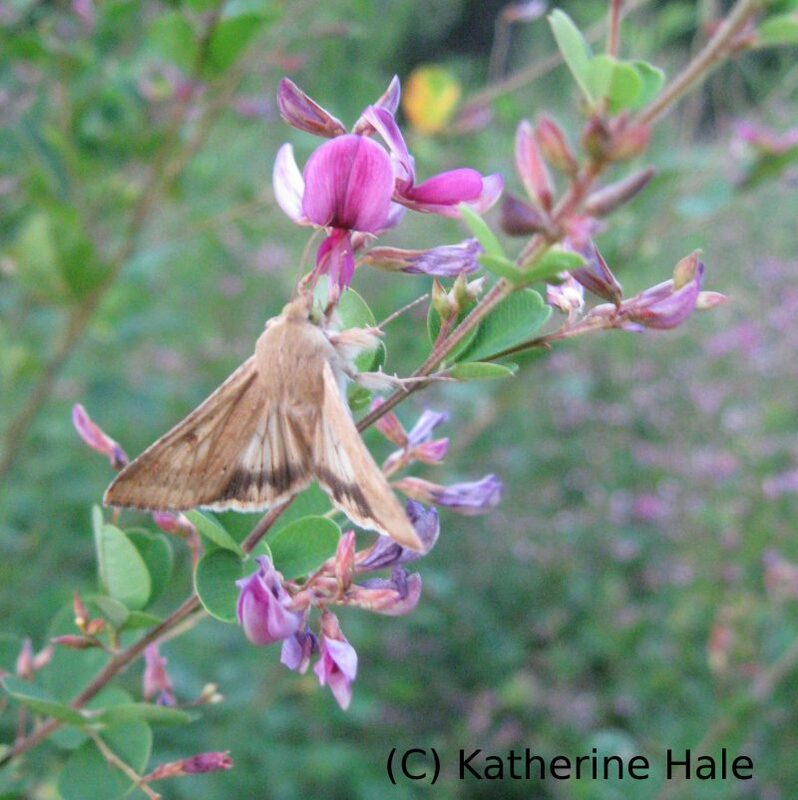 This time, the object of my affection was a tiny tan moth, fluttering among a haze of purple tick-trefoil flowers in a power-line clearing in early evening. Every now and then it would alight on a blossom and feed before hovering away again, its wings fuzzy blurs of motion as it zigzagged through the field. I stalked it with a camera for several minutes, never removing my gaze from my quarry. It posed obligingly for me on a nearby stalk of tick-trefoil, its wings fully spread. As I held my breath and snapped the picture, I couldn’t help but notice its piercing green eyes. I was beyond infatuated—I was hooked. What was I looking at? Zen master Fayan claimed that not knowing is most intimate, but the Greek philosopher Aristotle countered that all humans by nature desire to know. In this case, Aristotle won out. I posted the picture to an online community of naturalists and awaited their verdict, but I was unprepared for the truth. This beautiful moth and I had met before, under strained circumstances, and I hadn’t been so impressed with the results. The delicate creature that had captured my attention was actually the Corn Earworm (Helicoverpa zea) in an entirely different guise. You’ve probably met the Corn Earworm, too, even if you didn’t know it at the time. It’s the caterpillar lurking at the tip of your newly-purchased summer sweet corn, fresh off the roadside stands, the proverbial serpent in paradise spoiling any illusions of perfection. Just like us, the Corn Earmworm loves those tender, developing kernels, and leaves a nasty trail of brown feces behind as it works its way down the cob. More annoyingly, I find the Corn Earworm wriggling at the center of my best and juiciest tomatoes. There are all sorts of things that go wrong with tomatoes—early blight, late blight, cutworms, hornworms, blossom end rot—but the Corn Earworm is particularly vexing because you are so close to finally getting that ripe tomato in your mouth… until you notice the hole on the side conveniently hidden by foliage and the trail of frass smeared across the outside. Lovely. Unlike most caterpillars, which tend to eat only one or two kinds of plants, and only those plants, the Corn Earworm is not a picky eater. Its common name shifts to reflect wherever you find it—the Cotton Bollworm, Tomato Fruitworm, Sorghum Headworm, and Soybean Vetchworm are just a few of its many incarnations— but by no means is it limited to those particular plants. In all of its larval incarnations, it feeds with gusto on developing fruits—and its fellow caterpillars, if it can get them—before dropping down to the ground to pupate in the soil. After a rapacious juvenile delinquency, the adults settle down to relatively harmless existence nectaring on flowers. They are also, as I discovered, staggeringly beautiful in their own quiet way. But a female can lay thousands of eggs in her brief lifetime and perpetuate the cycle of destruction throughout the growing season. They don’t intend to vex me; it’s just an inevitable side effect of continuing their lineage. Once I knew them as adults, I could still squish the larvae when I found them, but I no longer mourned quite so much about the ones that got away. Learning to love the Corn Earworm might seem like a challenge, but this story ends better than most of my love affairs these days. Unlike most species I fall for, it is abundantly common and ubiquitous wherever agriculture is practiced. Its populations are continually increasing despite vast quantities of pesticides sprayed to control them. Its larval form is an obnoxious pest in my plantings, but they are not going away any time soon. Now that I know what to look for, I find the adult Corn Earworm Moth nectaring on the garlic chive flowers in the evening, just outside my doorstep. The adult Corn Earworm Moth comes to sit with me on an urban patio four stories off the ground, where few other flying things dare to tread. In the age of the Anthropocene, the Corn Earworm will be with us always. It’s just as well that I’ve found a reason to love them.